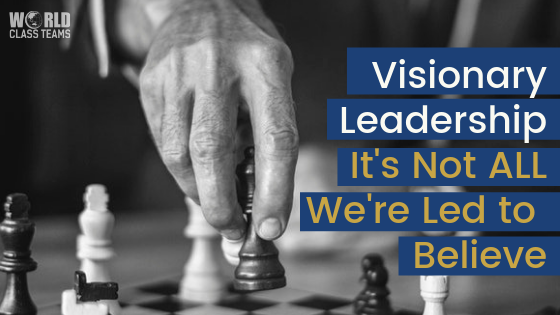 Visionary Leadership: It’s Not All We’re Led to Believe! Visionary leaders are those we often aspire to be like, such as Steve Jobs, Richard Branson or Walt Disney. We admire their ability to set a ‘big picture’ strategic direction and make it ‘come alive’ for their people. They inspire people to embrace change. There is not only clarity of direction, but a compelling story about why the change is worth pursuing. Yet visionary leadership is NOT always successful. The visionary CEO must be able to pass this vision on to their managers because it’s these managers’ and their teams who implement the change. They are the ones who ensure the CEO’s vision comes to fruition. The managers must be strongly aligned with the strategic direction and inspired by the reason for it, the why. The CEO must be sure their managers have truly adopted both the strategic direction AND the compelling reason for change. Hearing it is not the same as believing it! If the managers don’t believe it, they will NOT inspire their teams. They won’t create the alignment necessary for successful implementation of the strategy. A lack of true alignment will lead to failure, despite having a visionary leader! The emphasis on visionary leadership driving success relies on a very big assumption. It assumes that visionary leadership is automatically linked to a shared vision as opposed to each leader and manager having their own vision. A research project on visionary leadership involving 136 managers and their teams, was carried out by a group of professors from Europe and the USA (HBR February 28, 2019). They discovered the double-edged sword nature of visionary leadership. When middle managers were aligned with the C-Suite’s strategic vision, and exhibited visionary leadership themselves, the change was likely to be implemented successfully and rapidly. These businesses thrived and their people were highly engaged. Managers who exhibited visionary leadership as a trait, but who were misaligned with the company strategy, had a negative impact on the business. In fact, the more these misaligned managers displayed visionary leadership, the less strategic alignment and commitment were observed among their teams! Their teams indicated their managers created confusion about what the company strategy entailed. This led them to become somewhat disengaged, to ‘just keep their heads down’ and focus on their own tasks rather than to feel a vital part of the entire business. Whereas visionary leadership was a positive force when managers were aligned with company strategy, it became a negative force when their vision diverged. The important lesson for leaders here is that we must value both vision and alignment. Companies need to look for more than visionary leadership as a trait. They must also be careful to create strategic alignment among their managers. This alignment does not just happen by virtue of their role, it must be created, nurtured and checked. How sure are you that there is a common vision in your company? Does each manager share both this vision AND the reason for it? Do they inspire their team to implement this vision?